Kortrijk is a pretty and cosy town in the Flemish province of West Flanders in Belgium, well connected to Brussels and Gent with the fast train. Much of the city’s medieval architecture remained intact and is remarkably well preserved and restored. The city centre is one of the largest car-free areas in Belgium, which makes this pretty town a great place to enjoy relaxing strolls in the calm and quiet environment. The béguinage, as well as the belfry, were recognized by UNESCO as World Heritage Sites, and the beautiful gothic cathedral remains one of the highlights of this nice, clean and pretty town. In this beautiful frame, a unique, although still understated one day festival took place on 25 November. 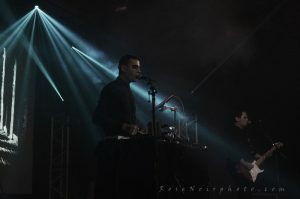 Soulfieldswave festival offered an incredibly strong line up of goth rock and electronic dark music in an easy-to-access venue at a very reasonable ticket fare. 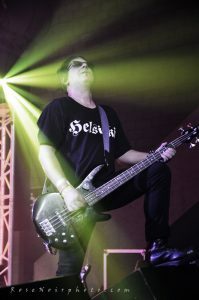 The festival headliners were Clan of Xymox; the pillars of the gothic rock for over 30 years which were followed by a list of the big names of the gothic scene such as She Past Away (TK), Golden Apes (DE) Ash Code (IT), just to name a few. A sort of hangar converted into an event venue Depart was very easy to reach on foot from Kortrijk train station and could host up to 1400 people. The atmosphere was still rather quiet in the mid-afternoon. 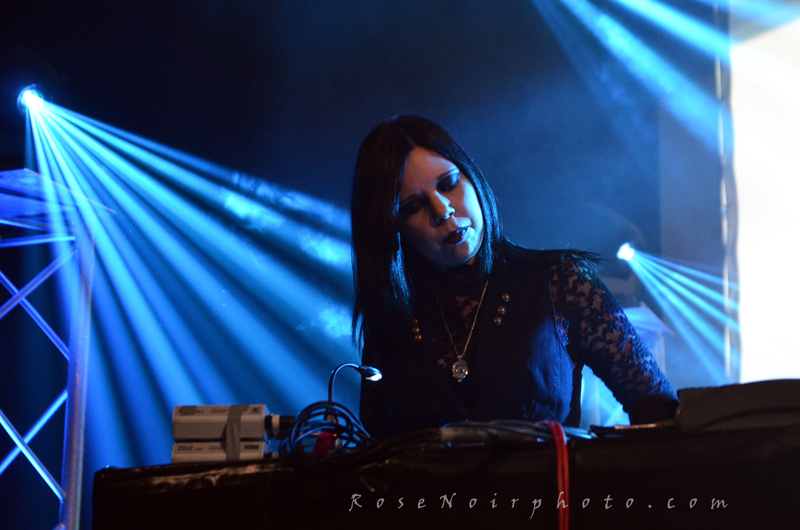 However, the venue started getting busy by the time She Past Away and Clan of Xymox were supposed to appear on stage. I flew from Milan very early in morning. 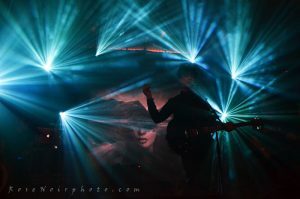 However, I arrived in time to see Ash Code who were just getting ready for the show and luckily I managed to get a good spot to shoot the gig and dance to their music till the last note. 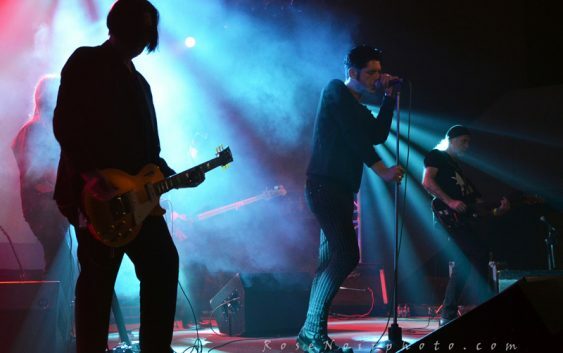 Although they formed in 2014 and are still a relatively new band in the dark new-wave scene, Ash Code already have a rather large fan base and they’ve gained a huge recognition from the audience and the press since the very beginning of their career. 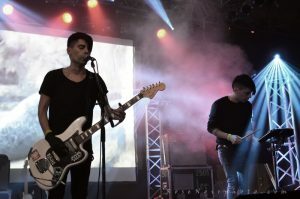 They are admired and supported for their unique sound which blends post-punk, electronic and new wave. 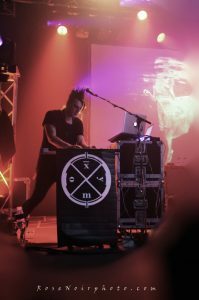 Ash Code released two albums, Oblivion (2014) and Posthuman (2016) characterized by the strong tunes which are played during almost every darkwave – synth or EBM DJ set. The trio quickly finished the sound check and started playing. They put out a well balanced and arranged stage performance as usual. The band created a mysterious and evocative atmosphere from the very first notes. 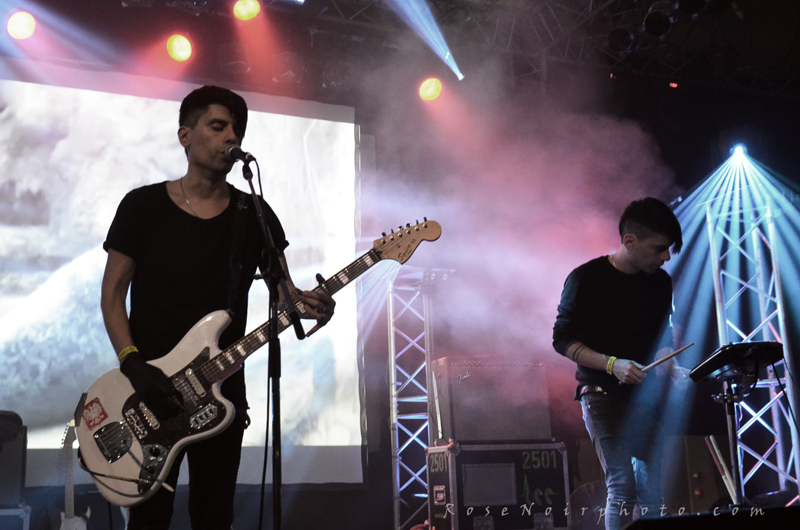 The incredible complicity and mutual understanding among band members is the guarantee to the impeccable outcome and success of the show; Claudia and Alessandro take turns as lead vocalists while playing the synths. They performed the hit numbers from Oblivion and Posthuman; albums of the remarkable elegance. They kept their masterpiece, Dry Your Eyes, as a perfect “Arrivederci” for the encore. The band left us in the great mood and ready for the next band. I was incredibly excited to see Golden Apes live for the first time; one of the most prominent German goth rock and obscure new wave bands. Golden Apes have been a rare gem in the independent wave gothic scene since their formation in 1998. The band’s sound expression can’t be labelled easily which makes them even more distinguishable. Since the release of their first album, this Berlin-based band have fought and proudly defeated the music industry’s aim: labelling. The only word which might represent Golden Apes would be ‘dark’. Their stage performance could be described as an endless, persistent and inexorable darkness. Peer Lebrecht’s vocal expression and charisma gives the band even greater appeal. They started the show with Cedars of Salt, the first track from their critically acclaimed last album Malvs which was released in 2016. 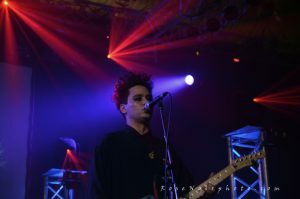 After the guitar introduction, Peer starts singing in the incredibly deep, dark and mournful manner; his astonishing vocal performance continued until the end of the show. They performed a great set list which included the Malvs songs: Ignorance, Verity, Shadowplay, Occam’s Razor, Grinding Mills. The band closed the set with Riot – a powerful, doomy and passionate number, which is also the last track of the same title album. It was the perfect introduction for the next band – She Past Away. SPA are the exquisite example of the revised dark-wave 80’s music expression combined with the recognizable post-punk guitar sound and the Turkish noir nihilistic and very personal lyrics. They sing about their personal views and thoughts on the anxiety brought upon by the social conventions. They made everyone dance to their masterpieces such as Sanri, Rituel, Insanlar, Kasvetli Kutlama. The frontman Volkan Caner looked absolutely magnetic, fascinating and powerful during his static but energetic stage performance; he always succeeds to put us in the dark dreamlike state. 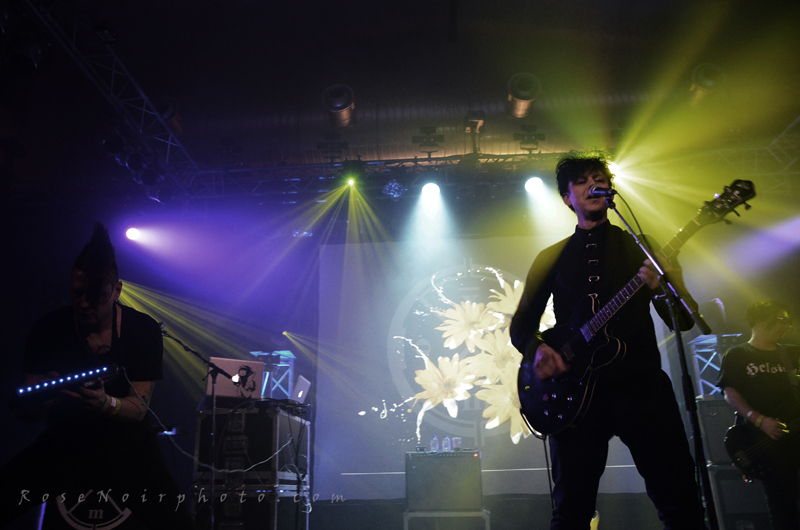 SPA prepared us perfectly for the outstanding headliners of the festival, Clan of Xymox. 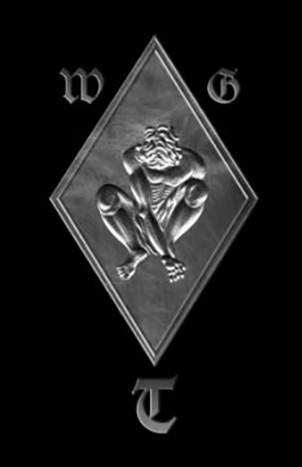 The band’s music feels like a time journey to the old-school gothic music days. 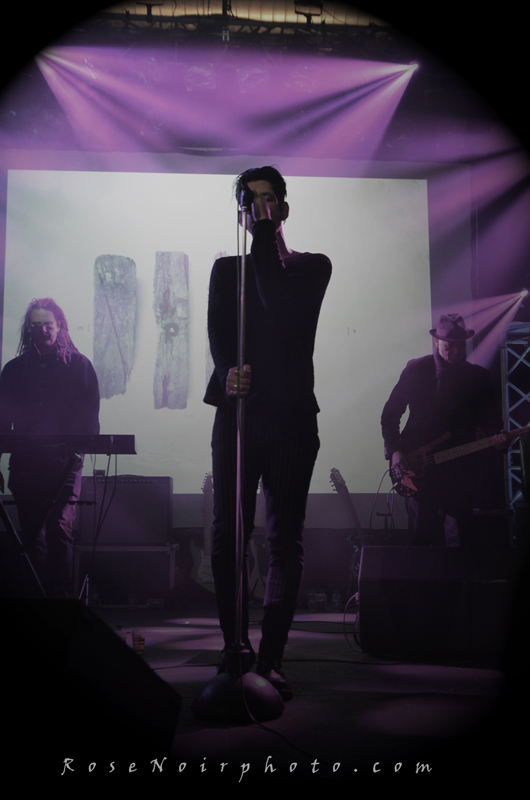 Their expression is characterized by the icy, pulsing synth sounds, evocative vocals, chilly, mechanical percussions and gloomy, ethereal guitars; the post-punk, gothic rock and new wave music expression. 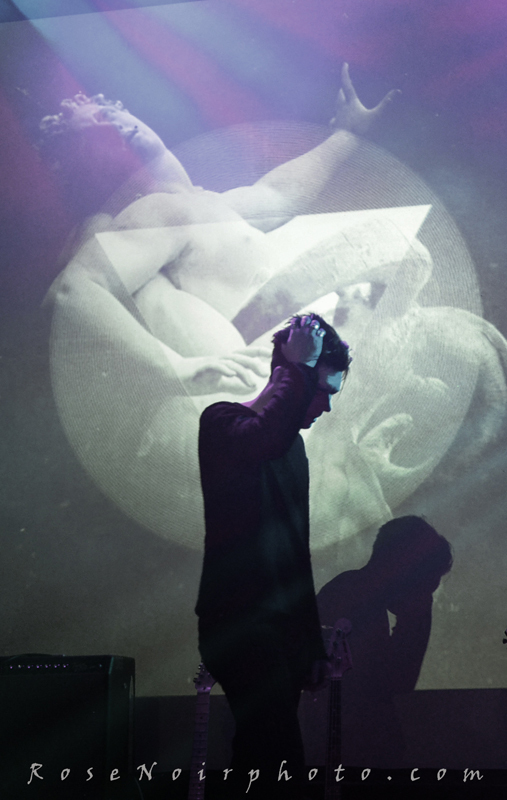 They were undoubtedly inspired by the most popular artists of the genre, from Joy Division to Dead Can Dance. Clan of Xymox don’t rely on their heritage. However, they include the old hits to the set list for their most devoted fans. Soulfieldswave set list covered the old and the new masterpieces. Their early releases’ songs blended perfectly with their last album’s numbers. They opened the show with Days of Black which was released on the same title album in 2017. During the show, they presented the materials from their 30 year old music legacy. 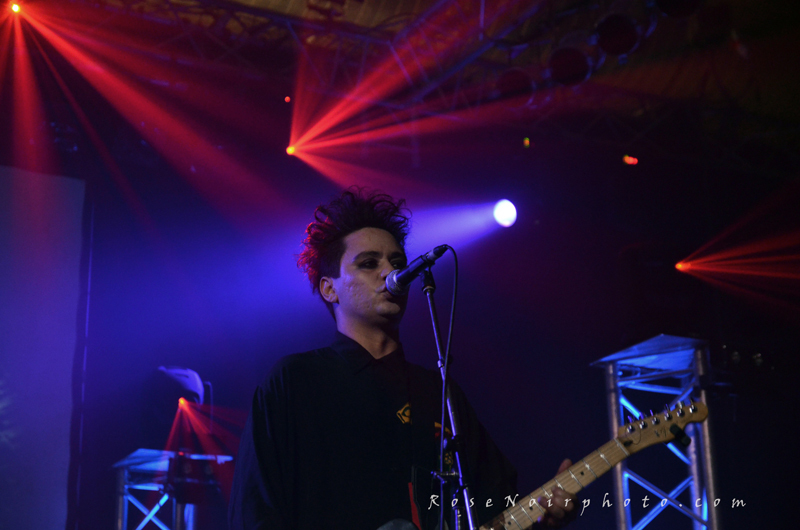 Ronny Moorings appeared on stage looking mysterious and powerful as always; discreet and magnetic at the same time. During the show, we could hear old masterpieces like Stranger which immediately rose the temperature. Louise, Emily and Jasmine and Rose warmed the nostalgic hearts of their faithful fans. However, they presented the last album with the wonderful Loneliness, Leave me Be and Your Kiss. They successfully closed the extensive set with A Day and Backdoor. The final gift to the loving audience was a wonderful encore during which they played This World and Bowie’s cover Heroes; it was the most powerful and meaningful way to end this incredibly atmospheric and nostalgic set. The band finally closed the night with Venus, the Shocking Blue cover which was released on Kindred Spirits (2012). The frenzy audience was left screaming for more. I’ve not once been disappointed in the Clan of Xymox live performance. They are amazing musicians who represent a milestone in the Goth rock scene and friendly and lovely people who never failed in giving me the best backstage fun I could wish for after watching a great show. This was a wonderful night which made me impatient and hungry for the next show!